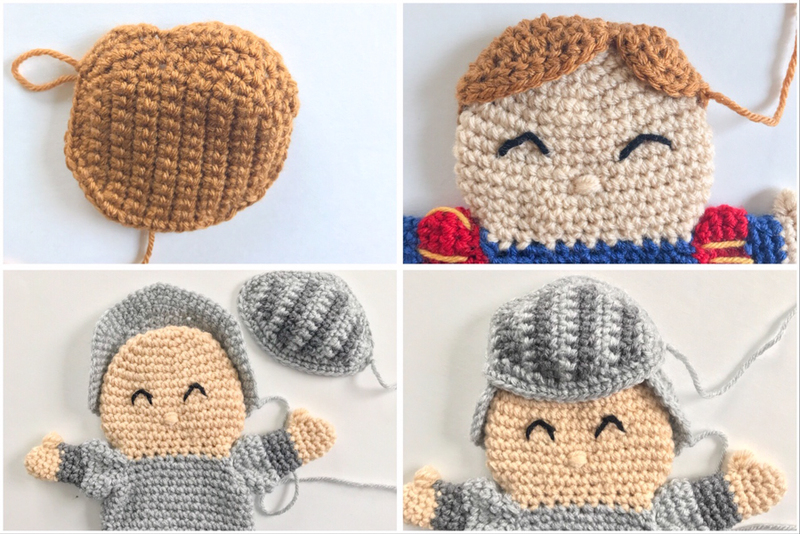 I am Erin, the toy maker behind ekayg designs. 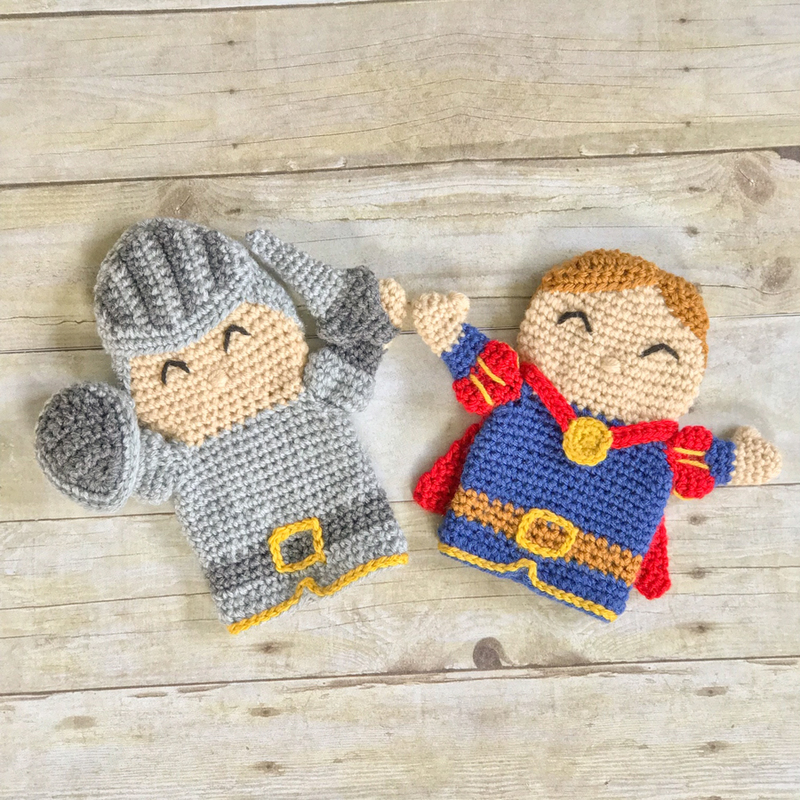 I began creating my own patterns for toys about 8 years ago, when money was tight and I needed to make gifts for my children. At that time, toy patterns were a lot harder to find than hats and scarves and blankets. 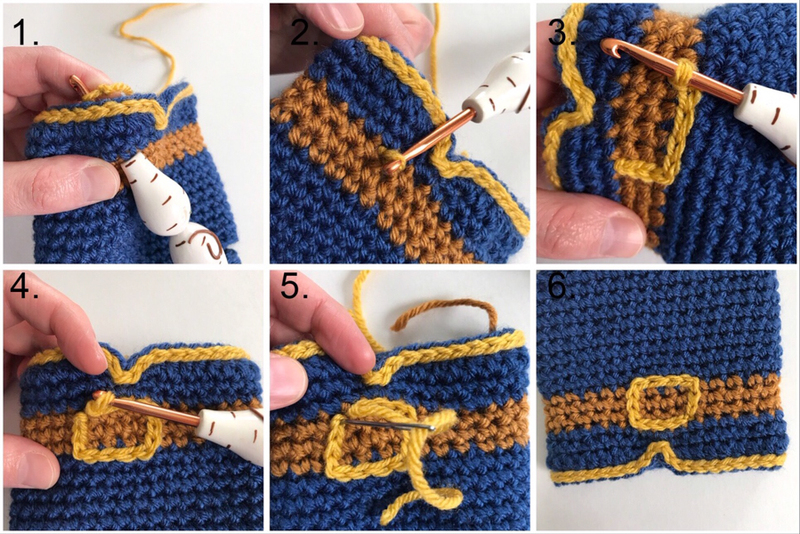 It was a fun and exciting challenge bring some of my own ideas to life with hook and yarn, and I still try to challenge myself with new ideas constantly. I strive to inspire creativity in little ones, with toys that tell stories, and toys with which they can tell their own stories. 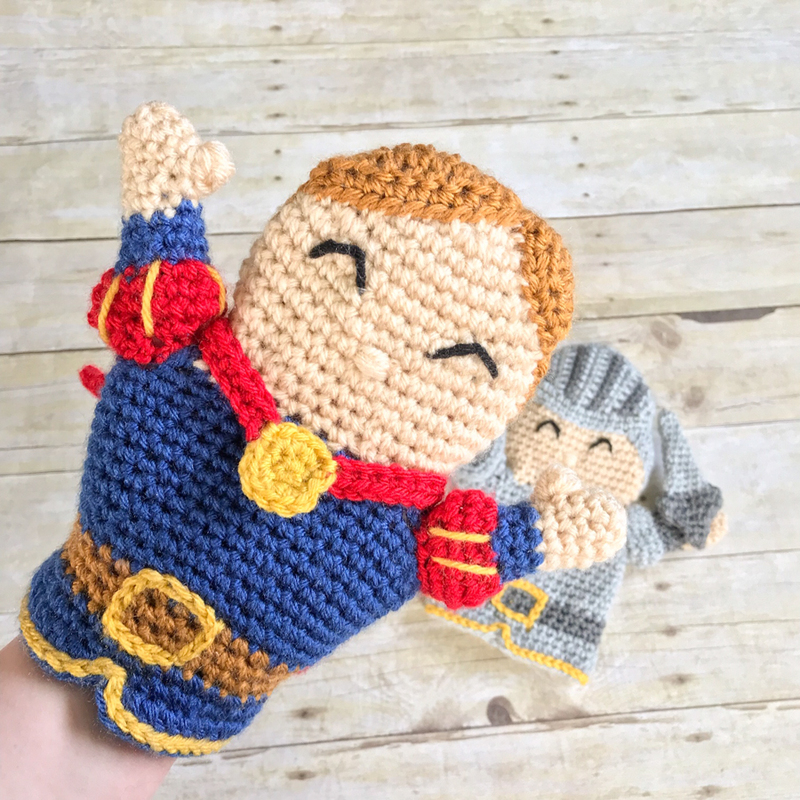 This is my fourth and final pattern in my fairy tale puppet series for The Hook Nook, and I am so thrilled with the positive responses to the others, from all of you! Thank you! 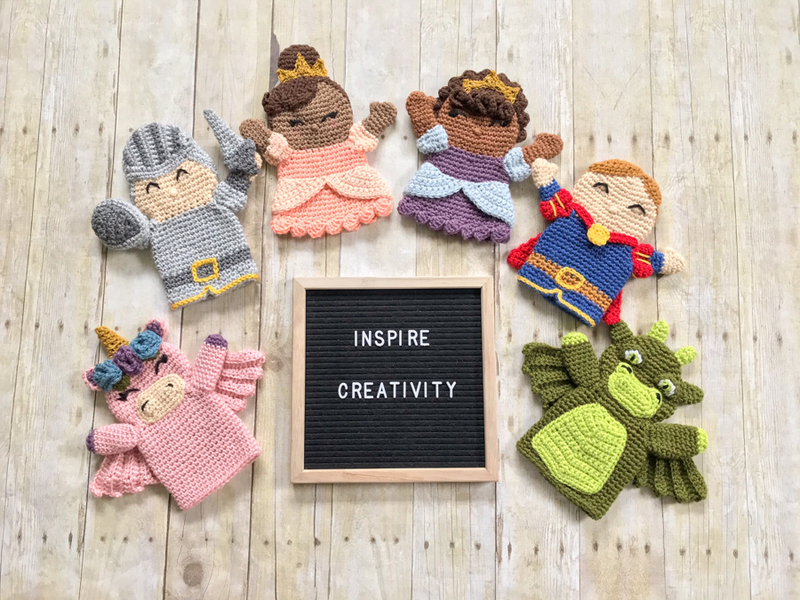 Now you can add a prince and a knight to your unicorn, princess, and dragon to create a great, interactive story with your little ones. Small amount of worsted weight black yarn for the eyes. Yarn over, and pull through 2 loops, leaving 2 loops on hook. Yarn over, and pull through 2 loops, leaving 3 loops on hook. Yarn over, and pull through 2 loops, leaving 4 loops on hook. 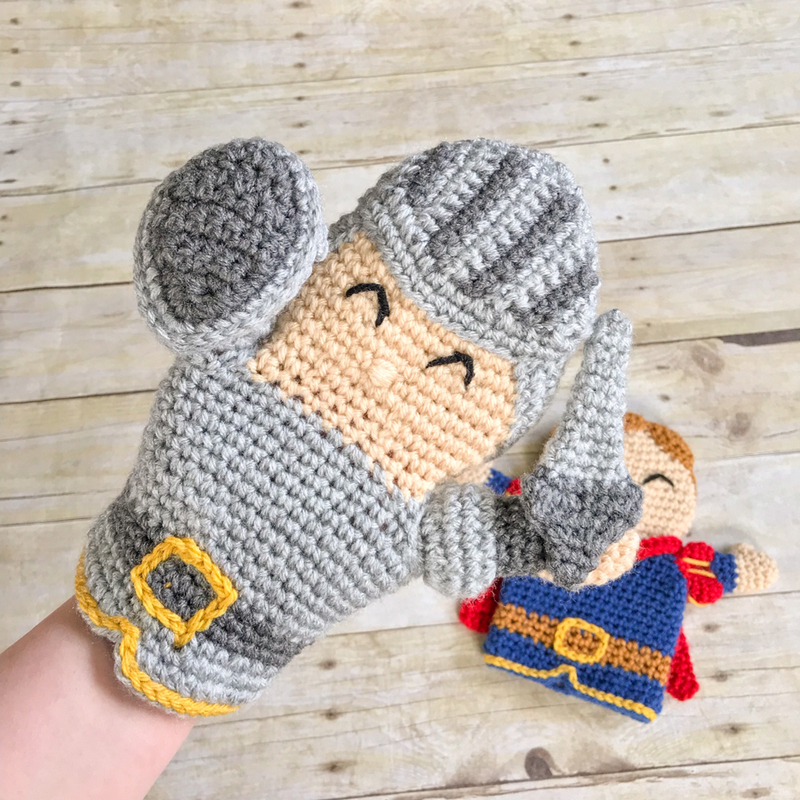 Notes: This pattern comes with instructions for making the prince OR the knight. It is worked from the top down, in the rnd, with no joining. The arms, hair, and accessories are made separately and sewn on. The eyes are embroidered on with black worsted weight yarn; the nose with matching skin color. Pictures below can give more details into the process. Change to Blue for Prince or Silver Heather for Knight, and fasten off the Beige. Forming the holes for the fingers. Pick Blue/Silver Heather back up and fasten off Honey/Dark Grey. For Prince OR Knight, attach Mustard for trim at the bottom of his shirt. For the belt, in Mustard, center it around the point at the bottom of the shirt, and use the surface sl st. Sl st 3 up the belt, 4 across, 3, down, and 4 across the bottom, connecting to the beginning sl st. Attach Blue/Dark Grey. Fasten off Beige. Fasten off, leaving long tail for sewing. Prince ONLY: Using a strand of Mustard, sew the lines onto the arms as pictured. 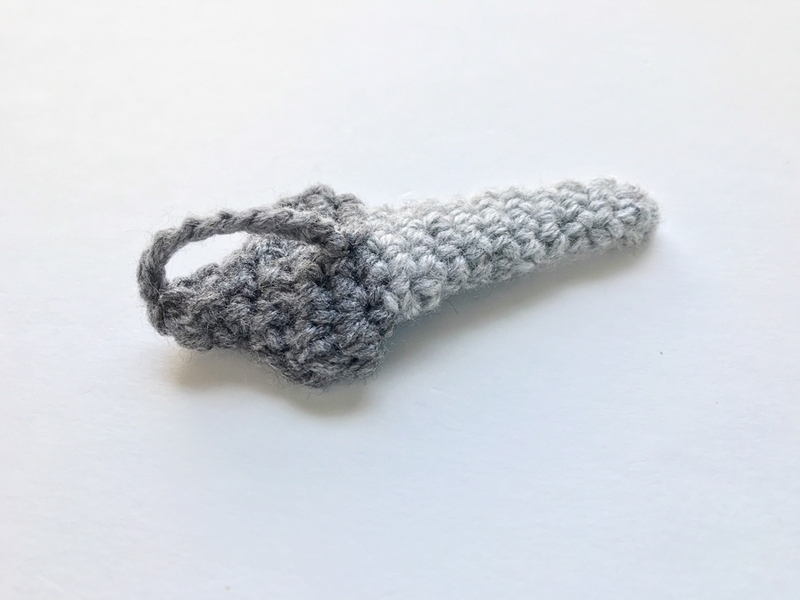 Knot off on the inside and weave in ends. Sew the arms onto the arm holes. 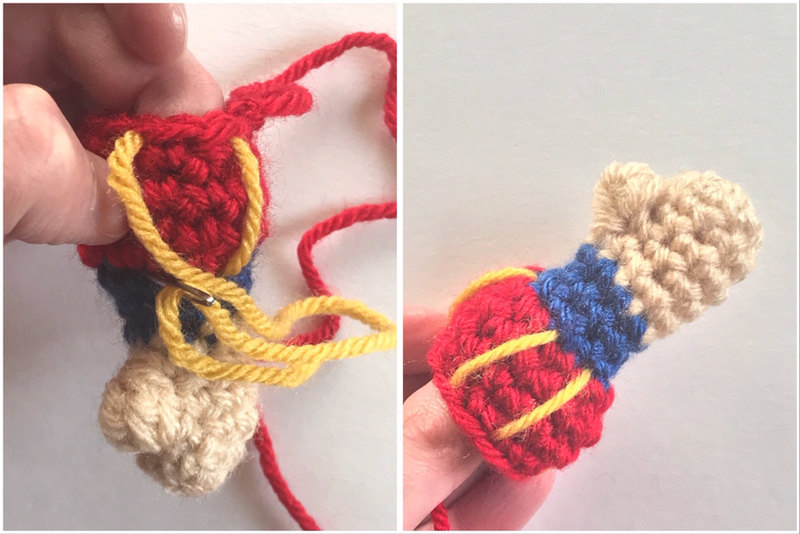 I turned the puppet inside out, then pushed the arms (right side out) through from the inside of the body, with thumbs pointed toward the head, then sewed the sleeve INSIDE the body, to avoid seams. Then turn right side out. 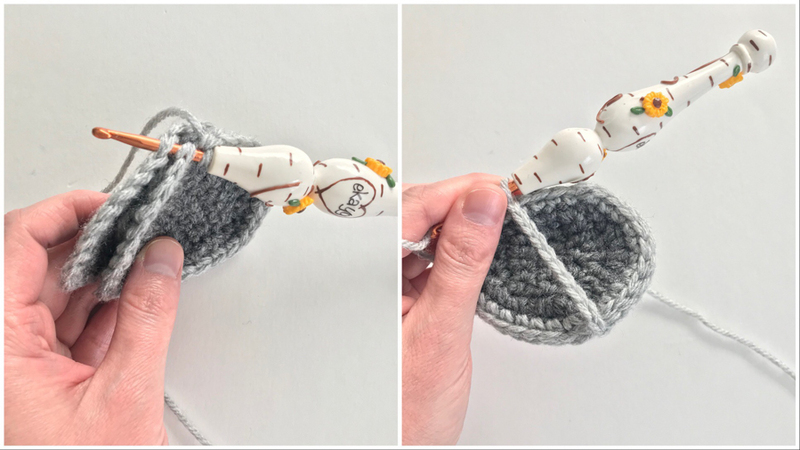 With the same yarn as your skin color, embroider the nose on the center of the face, about the 5th rnd up from the top of the shirt, wrapping the yarn around the same spot about 5 times, until you have a nice little bobble. Then, with black yarn, embroider the eyes about 1 to 2 rnds above the nose, with about 3 sts between them. 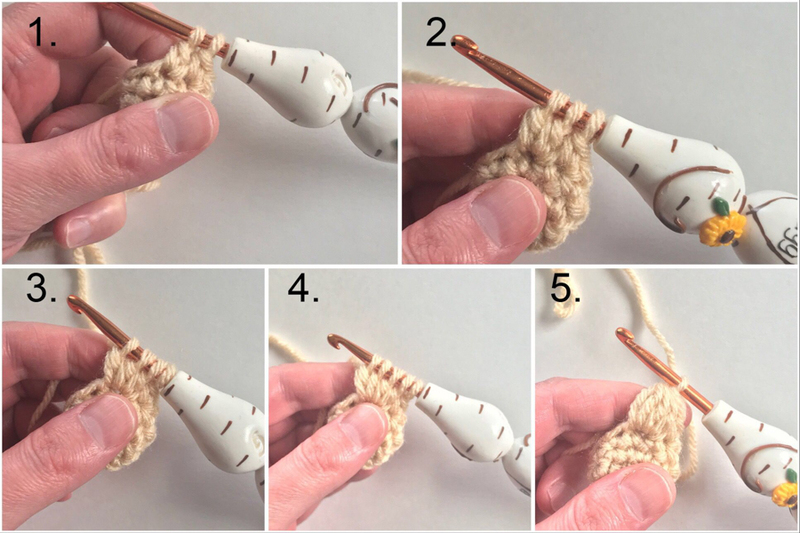 The trick to getting the arch is to wrap the yarn around itself on the arch, and sew back through the head. Fasten all ends off inside the puppet, and weave in. Rnd 1: continue to work 48 sc evenly around the hair until you get back to where you started. This amounts to 18 sc down each side, and 6 sc across the bottom, and the top. Do not fasten off or turn. Begin bangs here. Fasten off, leaving a long tail for sewing. Sew hair onto head, with bangs over the top, and his “part” to the right side facing him. Repeat rows 1-17 and Rnd 1 of Hair. Sew to the back of the head, around the bottom and side, but leave the point sticking up. You will sew the mask to this. The point is simply where one of your increases fell in your final rnd. I did not do anything special here to make that more prominent. It comes together when you sew it to the front of the mask. Change to dark grey for next 2 rows, but don’t fasten off light grey. Pick up the light grey for next 2 rows, but don’t fasten off dark grey. Pick up dark grey for next 2 rows, but don’t fasten off light grey. Pick up light grey for next 2 rows, but don’t fasten off dark grey. Pick up light grey for next 2 rows. Fasten off dark grey and continue with light grey. Rnd 1: with right side facing, sc around entire piece. Fasten off, leaving a long tail for sewing. Sew the front of the mask onto the head, just above the eyes, as though the face mask of the helmet is lifted up. Do NOT fasten off after row 14. Row 1: turn and sc in 2nd ch from hook, and in each ch down back toward row 14, sc in first 13 sts across row 14, leaving last st unworked, ch 11, turn and sc in 2nd ch from hook and in each ch down, sl st into final st of row 14. Join with sl st, and fasten off, leaving tail for sewing. Sew the straps of the cape to the edge of the button, with about 3 sts on the button in between. You can sew it down onto the puppet, or leave it free for dress up. Attach light grey, fasten off dark grey. Place both shields together and sl st around to join them. Ch 10 and join diagonally across the back of the shield for the handle. I did not sew the shield onto the knight’s hand, but left it to be slipped over his hand during play. You can do whichever you prefer! Begin with light grey in a magic ring. Attach dark grey and fasten off light grey. Fasten off leaving a long tail. Use tail to sew end closed, but don’t trim yet. Insert your hook into a st near the tail. Using tail, pull up a loop and ch 8. Sl st into a st a few rnds up, just below the light grey. Fasten off and weave in ends. 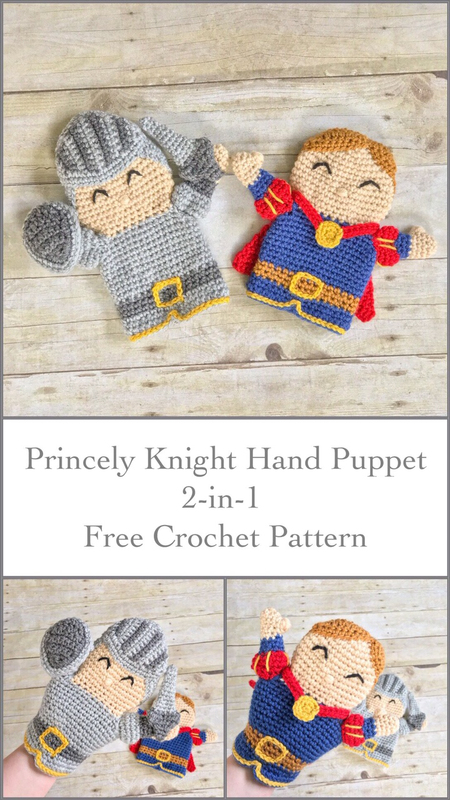 I hope you have enjoyed all of the puppet patterns from this fairy tale puppet collection! If you happen to make any one of my puppets featured here, I'd LOVE to see them. Tag me on Instagram or Facebook !